Relay Holders Bases. Genuine Hella Automotive Fused Relay 12V 15AMP 4 Pin. Genuine Hella Automotive Fused Relay. This is a genuine Hella part. Not a cheap imitation. Hella Part No. 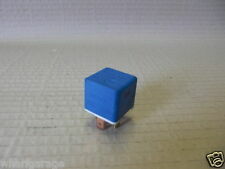 1 x 12V 40 Amp 4 Pin Fused Mini ISO Relay With Bracket. Multifunctional Relay. Search “Hella Online Catalogue”. Engine Code: M 266.920 | Relay function: Heated rear window | Relay function: Fuel Pump | Relay function: Air Horn | Relay function: Secondary Air System | for OE No. : A0025421319. Hella Part Number:4RA00779100. Made by Hella in Spain. 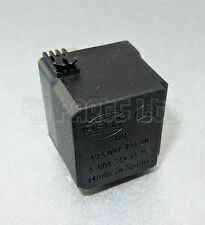 Genuine 4 PIN Black Multi Purpose Relay. Number Of PIN:4 PIN. This Sale is for a Hella relay. Genuine Hella Skirted Relay. Relay is sealed underneath. with resistance. 5 pin Change Over. Product type : FLASHER UNIT 12V 4X21W NO BKT. Delphi Oxygen Sensors. Lucas Oxygen Sensor. The complexity of electric and electronic systems in vehicles has increased significantly in the past few years. DAF 0118159, 1519523. BMW 7920100. DAIMLER A0025422419. HELLA 4RD 003 520-091, 4RD 003 520-031, 4RD003520031, 4RD 003 520-093, 4RD003520093, 4RD 003 520-097, 4RD003520097, 4RD 003 520-127, 4RD003520127, 4RD 007 903-001, 4RD007903001. Product type : FLASHER UNIT FUSED RELAY (BLADE) 12V CW BRACKET. The complexity of electric and electronic systems in vehicles has increased significantly in the past few years. General Electrics by HELLA — WE MASTER COMPLEXITY ". Lambda Sensors. 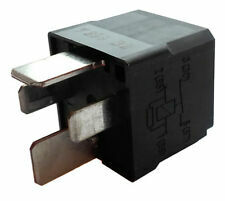 Product type : FLASHER UNIT RELAY 12V N/O 4-PIN 40AMP NO BKT RE. Lambda probes & sensors. Delphi Oxygen Sensors. Lucas Oxygen Sensor. The complexity of electric and electronic systems in vehicles has increased significantly in the past few years. Genuine Hella Skirted Relay & loom. Relay is sealed underneath. with resistance. Simca Talbot. Ford Capri Mk2 1/74 - 1/78. Hella Electronic Direction and Hazard Flasher Unit. Sale is of 1 boxed flasher unit with instruction / data sheet. Opel GT, GTI. 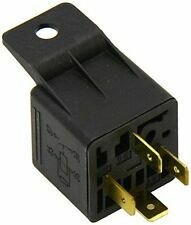 12v, negative earth, 5 pin. 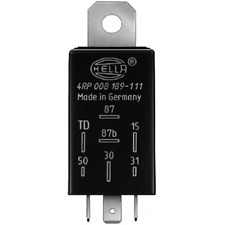 Hella 4DB-003-750-65 flasher relay. the picture shows 4 relays the price is for 1 relay. shelf cl-3b5. For Sale - Yellow Hella Relay, fits Astra H and possibly other models. GM part No 90 226 846. Type 4NM 001 809-15. Hella Flasher Unit. Product type : FLASHER UNIT 24V 2 1X21W 5W NO BKT. Delphi Oxygen Sensors. Lucas Oxygen Sensor. The complexity of electric and electronic systems in vehicles has increased significantly in the past few years. Resistor, interior blower - Hella 9ML 351 332-201. BEHR HELLA SERVICE: 9015934. BEHR HELLA SERVICE: 351332201. Site Safety. Safety & Workwear. Office Supplies. Catering Supplies. Janitorial & Hygiene. Breaking 2005 Saab 9-5 Linear TiD Estate 5 Speed Manual. CLEAN, WORKING ORDER, READY TO FIT! 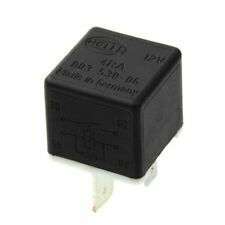 (R15) Hella 5 pin green Relay, 4RD 003 520-46. Part number: 4RD 003 520-46. Lambda Sensors. Lambda probes & sensors. 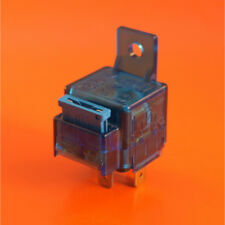 Product type : FLASHER UNIT RELAY 24V C/O 5-PIN 30/15AMP NO BKT. Delphi Oxygen Sensors. Lucas Oxygen Sensor. The complexity of electric and electronic systems in vehicles has increased significantly in the past few years. Product type : FLASHER UNIT NORMALLY OPEN RELAY 12V. The complexity of electric and electronic systems in vehicles has increased significantly in the past few years. General Electrics by HELLA — WE MASTER COMPLEXITY ". PART No: DAC7686. A 4RA RELAY. FITS: XJS / XJ40 / X300. HELLA 003 510 34. JAGUAR DAIMLER. The complexity of electric and electronic systems in vehicles has increased significantly in the past few years. General Electrics by HELLA — WE MASTER COMPLEXITY ". Product type : FLASHER UNIT. Spark Plug Tools. Lambda Sensors. Lambda probes & sensors. Product type : FLASHER UNIT B LAYOUT 24V 20AMP WITH RESIST. Delphi Oxygen Sensors. Lucas Oxygen Sensor. The complexity of electric and electronic systems in vehicles has increased significantly in the past few years. A universal connection flasher unit for LED indicators that do not contain an electronic pulse. For the following Hella Products: 2SK343910-037, 2BA009001-411, 2BA009001-511, 2SD009362-201. 100% Genuine UK sourced Hella product. Spark Plug Tools. Direct Fit. DIY Car Service Parts. Champion Glow Plugs. Bosch Oxygen Sensors. Adjusting range to [min.]. Adjusting range to [sec.]. 0 min, 0 sec. Product type : FLASHER UNIT CHANGE OVER RELAY 12V. The complexity of electric and electronic systems in vehicles has increased significantly in the past few years. General Electrics by HELLA — WE MASTER COMPLEXITY ". Here we have a choice between a genuine VW Audi relay number 387 or 393' All in full good working order . You are buying one single relay on this listing so please let me know which relay you require when buying. Thanks for looking Please check out my other items in my ebay shop for more parts Be sure to add me to your favourites list! Check out my other items! HELLA 24 volt 20 amp relay part no. 4RA 003 510-091 with built in holder. Product type : FLASHER UNIT 12V 4X21W BKT. The complexity of electric and electronic systems in vehicles has increased significantly in the past few years. General Electrics by HELLA — WE MASTER COMPLEXITY ". It is pre-fitted with cable assembly. Manufacturer Hella. Who are Beacon Monkey?. Product condition New. Item code 8JD745801-001. 4RA 007 791-. 4RA 007 865-. HELLA 4RD 12VOLT RELAY. ====================================. This is from a U.K. Car. Suspension Ball Joints. Belt Tensioner Wheels & Bkts. Any claims after 24 hours cannot be accepted. Rear Lights. Front Exhausts Cats. PEUGEOT : 6555.11, PEUGEOT : 6555.34, PORSCHE : 928.615.101.01, PORSCHE : 993.615.10. General Electrics by HELLA — WE MASTER COMPLEXITY ". The complexity of electric and electronic systems in vehicles has increased significantly in the past few years. Spark Plug Tools. Direct Fit. Manufacturer Part Number5WG002450-291. Product type : AUTO ELECTRICAL FLASHER UNIT UNIV 24V 10-110W. The complexity of electric and electronic systems in vehicles has increased significantly in the past few years. General Electrics by HELLA — WE MASTER COMPLEXITY ".